Results from Nigeria's widely criticised elections are due to be announced later, amid tight security at the election offices in the capital. 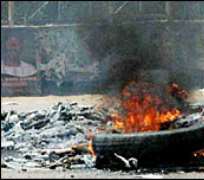 At least 200 people died during the past week and the polls were "not credible" say European Union observers. Ruling party presidential candidate Umaru Yar'Adua is reported to have taken a commanding lead so far. But the two main opposition candidates have told their supporters to reject the results and want a re-run. European Union observers said the elections had fallen far short of basic international standards and were marred by violence, poor organisation, lack of transparency, widespread irregularities, significant fraud, voter disenfranchisement and bias. "These elections have not lived up to the hopes and expectations of the Nigerian people and the process cannot be considered to have been credible," said Max van den Berg, chief EU observer, in a statement. Vice-president turned opposition leader Atiku Abubakar, and Muhammadu Buhari, said the governing People's Democratic Party (PDP) had rigged the elections. Twenty-four candidates stood seeking to succeed President Olusegun Obasanjo as Africa's most populous nation seeks for the first time to replace one elected civilian head with another. Early results show Mr Yar'Adua won by a landslide in the oil-rich Niger Delta, where some of the worst abuses have been reported, and he leads the opposition in almost all Nigeria's other 35 states. The main exceptions are the two opposition strongholds of Lagos and Kano, with Mr Abubakar declared the winner in Lagos and Mr Buhari polling strongly in Kano. "It is likely we will call our supporters as from Monday to come out and protest if the PDP announce they have won the election," Mr Buhari told Reuters news agency. Nigeria's biggest election monitoring group said the presidential poll was so flawed that it should be scrapped and held again. "In many parts of the country elections did not start on time or did not start at all," said Transition Monitoring Group chief Innocent Chukwuma. But election commissioner Maurice Iwu said the election had been a success that would be remembered for generations. In some states, voting carried on into Sunday despite official announcements that this would not happen. Voter Donaman told the BBC News website that election material was delivered late to his polling station in the central Benue Sate, after most people had gone home. "Thugs were then left alone to vote and each one of them voted for the PDP over and over as many times as the ballot papers were available," he said. He said he tried to vote for an opposition candidate but the ballot paper was ripped from his hand. Officials had struggled to deliver some of the 60m ballot papers to stations in time for the vote. They only arrived in the country on Friday evening. In the central state of Nassarawa, a number of policemen were killed while escorting election officials with the papers. Police fired on crowds in the northern state of Katsina, the home state of both Mr Yar'Adua and one of his main opponents, Muhammadu Buhari. Four people were killed in clashes there after only half the voting papers arrived. In nearby Kano, men armed with cutlasses and guns stole ballot boxes while in Onde state, in the south-west, men disguised as policemen abducted election officials. The boldest attempt to disrupt polling was in the hours before polling was due to start when a petrol tanker laden with gas cylinders was used in an attack on the electoral commission's headquarters in Abuja. The attackers tried to roll the unmanned tanker into the building, but the vehicle missed its target and came to a halt. The presidential poll was running alongside elections for the National Assembly and Senate. The new government is scheduled to take power on 29 May. Nigeria - one of the world's biggest oil producers - is of key strategic interest to both the West and the growing economies of the East. But despite the country's huge oil wealth, tens of millions live in poverty.